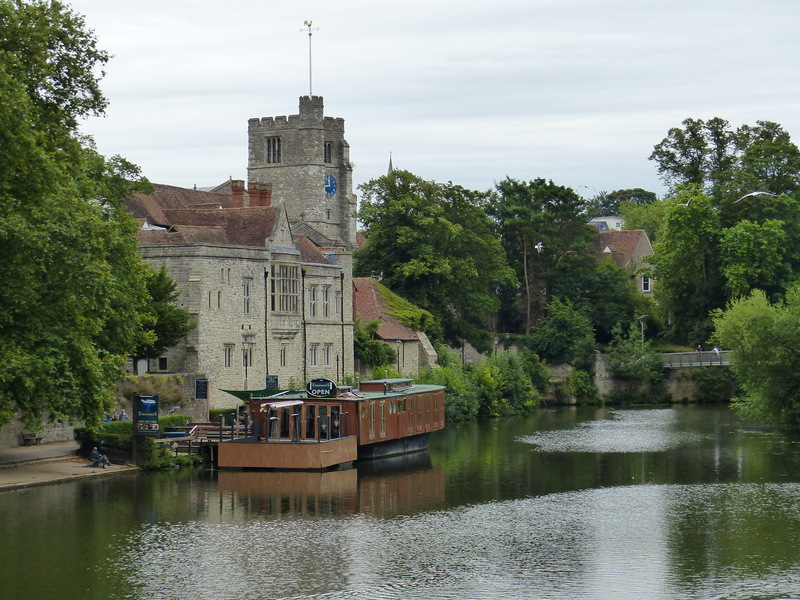 Meandering Around Maidstone – Run. Ride. Roam. Do we stay or don’t we? Do we go or don’t we? Do we ride on or don’t we? Decisions, decisions. I made my daily, dawn trip over to the campsite’s empty and “all to myself” bathroom block to fill in time so as not to disturb Steve too early in the morning hours. I just have to say, the facilities at this campsite are 5 star! Immaculate. Pristine. Awesome! Everything sparkles and shines. It’s like it’s never used, it’s so super clean, despite the constant traffic from a campsite full of people. The shower was sensational too, and BBC radio was playing for the user’s enjoyment and entertainment. I happily gave Steve some extra slumber time, while I undertook my morning routine in this shrine to suds and sparkle. When I finally emerged, what was there to greet me, along with the pink glow of sunrise? Rain! Yep, rain again! We had been reading a variety of weather reports last night, with different websites saying we should expect rain on either Wednesday, Thursday or Friday, depending on which we were to believe. None of them mentioned Tuesday though! This wasn’t predicted! Darn! 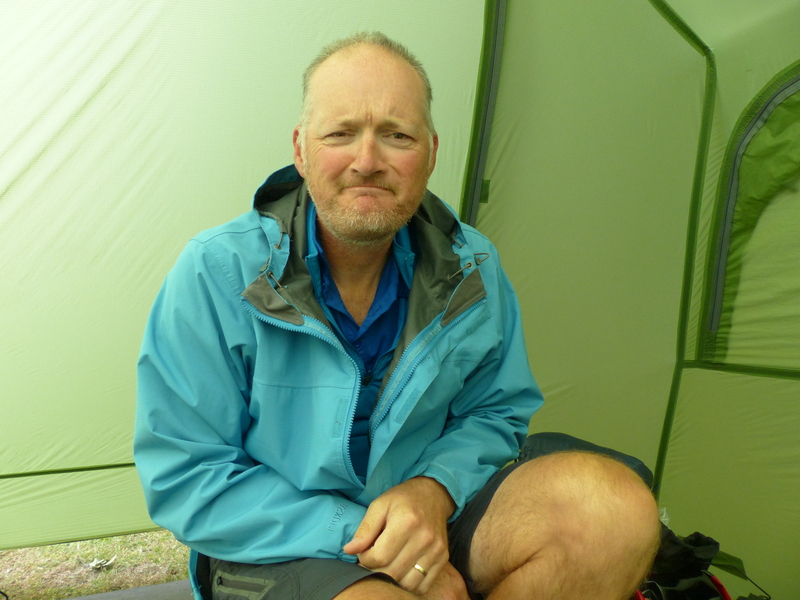 I crept back into the tent and sat listening to the patter…patter…patter get louder and stronger and more frequent as that pesky precipitation pounded the tent. When Steve awoke, we tossed up what to do. Stay and sit it out? Ride on in the rain? Wait to see if it eases and ride on later? Not wanting to pack up a wet tent, yet again, we figured we’d be camping somewhere tonight, so it might has well be here in a nice, peaceful place with the added bonus of a Ritz quality camp bathroom. See what influences us these days…water that’s hot and flows continuously, water that flows from a shower head at more than a spit or drizzle and bathrooms that don’t make one want to slather antibacterial gel all over oneself after every use. This place was A+ and the fabulous facilities were an influencing factor. (We’ve had some pretty dodgy facilities in other places of late, so where we are at the moment feels like a spa!). The decision was made, we’d stay another night, wait for the rain to clear, have a look around Maidstone and stock up on supplies. We’d run out of quite a few things and had been getting by on the meagre offerings from corner stores and campsite shops, since our routes hadn’t taken us past any major supermarkets. We needed to stock the pantry pannier. Then, an hour after we’d made that decision, we looked at the sky and it was clearing. The tent was drying and the air was warming up. Hmmmmm, now what!? Revoke our previous decision and pack up and move on? We aren’t in any hurry to get somewhere, but still, we don’t want to sit around if we could be riding on. What to do, what to do? Ah, enough procrastinating, let’s just stay. Let’s enjoy another night in a nice campsite and, as Steve said, “Enjoy the awesome facilities and the sensational showers!” OK, we’re staying. With some time up our sleeve now, we caught the bus into Maidstone for a look around. First stop was elevenses, since we’d run out of breakfast supplies yesterday and were both feeling a bit peckish by this time, not having had our usual muesli and power porridge. Thanks again to my Happy Cow App, we located an all vegan cafe right in the centre of town, so that was bound to supply something worthy of elevenses. Steve decided to partake of their offerings too and we both had a cheese toastie (made with cashew cheese). It was great! Steve’s verdict? “That’s pretty good for fake cheese!” It had passed the test! It was quite like the vegan cheese toasties I make myself at home, so since Steve has ditched dairy and has declared the alternative to be quite palatable, I can serve them up to him now too. Elevenses over and enjoyed, we set off for a roam around the town. Maidstone is an old market town and it had similarities with the design of East Grinstead, with the row of buildings dividing the main street into two halves, we’re guessing this is a left over from when there were market stalls there, such as it was in East Grinstead. The town was a mix of old and new, with some lovely historic, timber framed buildings, narrow streets and lane ways combined with the less aesthetic and questionable architecture of the 60’s and 70’s homage to brick and concrete. The Archbishops’ Palace. This was once held by the Archbishop of Canterbury. 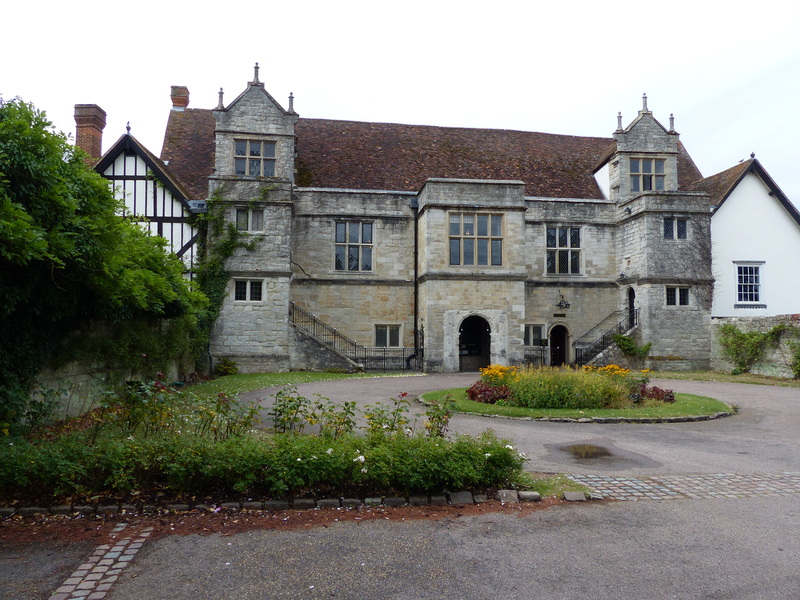 It was a manor house, gifted to the archbishops in the 7th / 8th century. We roamed the town, along the river, then took to the outskirts. We took many wrong turns and ended up down a couple of ‘Do Not Enter’ roads, so our roaming took us far and wide, round about and this way and that, some of it intentional and some of it just plain losing our way! At least we got some long walking exercise on our bike-free day. 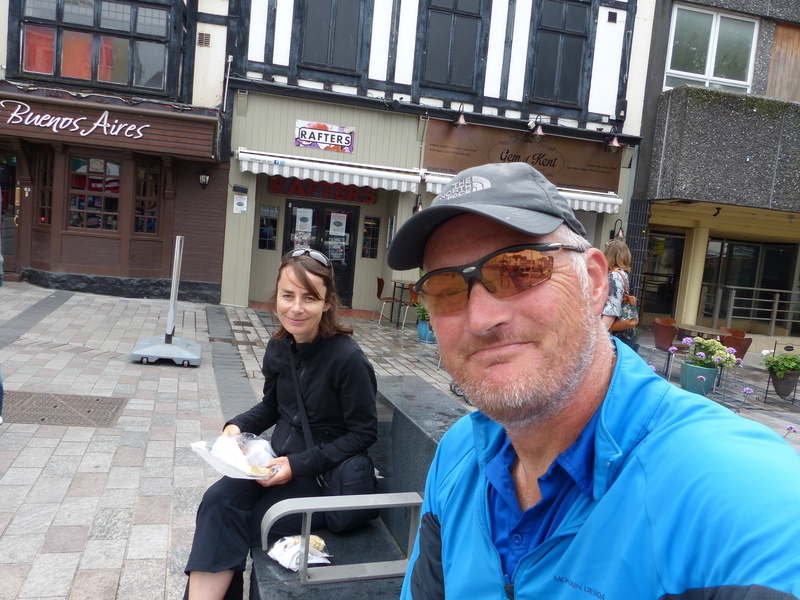 After a few hours of roaming, strolling and navigational failures, we once again made it back to the centre of town, to find a bite to eat for lunch. I had decided to return to Fortify Cafe, having perused the menu at elevenses and discovering many more tasty options to tempt me. Steve was still deciding what to do to feed himself. In the end, he decided to go for the vegan option again too. So our plan to pick up our separate take-aways and rendezvous on a bench for lunch, now became a pleasant, shared, sit down affair at an outside table at the little vegan cafe. I had the absolute BEST sandwich ever! It was awesome! So, so, tasty. Steve doesn’t go into quite the same raptures as me, when discovering superb vegan offerings, but his review of the sandwich on his plate was, “It’s yummy.” Goodo! I’m always so glad when he enjoys this sort of food, because it’s another stellar example of how plant-based food can be enjoyed by anyone! We followed up our sandwich with a sweet treat and Steve enjoyed his Chocolate and Guinness Cake and I had a piece of super delicious, Raw Walnut Coconut and Date Pie. It was all simply superb. Oh, and I ordered a pot of tea and got a pot with tea leaves in it! Real tea! It just got better! Fortify was fabulous! “They use them on the Dover runs,” he told me and went on to give me the story of the catamaran company and the Dover-Calais run and I chatted about the Tasmanian end of the company and its ups and downs. “Oh, it’s quite famous!” he assured me. He asked how I’d found the store and when I told him, he thanked me for stopping by because his son is trying to make a go of it and he was helping him out behind the counter. I wished him success, saying we need more stores like that, with options and variety for good, wholesome and ethical shopping choices, so I hoped the little shop thrived. After this delightful in-store chat, Steve and I finished our roaming, gathered some final stocks for our dwindling supply stores from our friends Marks and Spencer, then caught the bus back to camp. Steve headed straight for the horizontal snooze position and had a late afternoon snore, while I fired up the Trangia for a cup of tent tea. Then…it started raining again. This is the face that returned to the tent after venturing outside. It’s raining again! I’m in a raincoat again! I’m zipped up in a tent again! Bah! That was the day. Another slow and easy one I’ll admit. An unplanned and, as the weather turned out, possibly unnecessary layover. A ‘not very much to report’ sort of day and you’d be forgiven for thinking all we did was sit and eat, from my recount of events! We did have a long and pleasant roam though. In fact it was so pleasant but navigationally challenged that we forgot to take photos, so we don’t even have many of those today. Still, we enjoyed the day, so I guess that’s what counts. We shall power on tomorrow and put some more kilometres on the wheels. We’ve had some top notch riding weather of late and beautiful balmy nights and mornings in the tent, so we’re hoping to be blessed with that again. If not, I’m sure we’ll be blessed with many other wonderful things instead…friendly people, gorgeous scenery, special sights and memorable experiences. Maybe even another Royal Standard bathroom! Ah, the simple pleasures in life. They mean a lot these days. Those little things are just the icing on this glorious cake we call England, and we’re devouring it every day. Pass me a plate, I’m ready for another slice thanks.